Do you have what it takes overcome shoulder pain and join the #premierfamily? 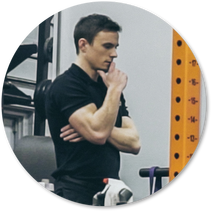 Evan Lewis is a nationwide leader in Neuro Therapy and founded the Baltimore area's only specialist Neuro Therapy facility for athletes who want to recover faster from injuries, prevent future injury, and optimize performance. You might know Evan from his work with MLB, NFL, and NCAA players around the country. After discovering the benefits of Neuro Therapy while playing football at Penn State University, he opened Premier Neuro Therapy in 2015. Within just 6 months of opening, clients were so excited about Evan and his techniques that athletes from around the country began calling to request his services. Since then, he has been featured by numerous publications and productions around the country including WEEI Boston Sports News, Jacksonville 1010XL The Drill With Dan Hicken And Jeff Prosser, and The Washington Post. Today, Evan continues to strive towards his mission of bringing Neuro Therapy to as many people as possible. This work begins in the Baltimore, MD area, where he looks forward to introducing you to Neuro Therapy and getting you back to the active lifestyle you love.